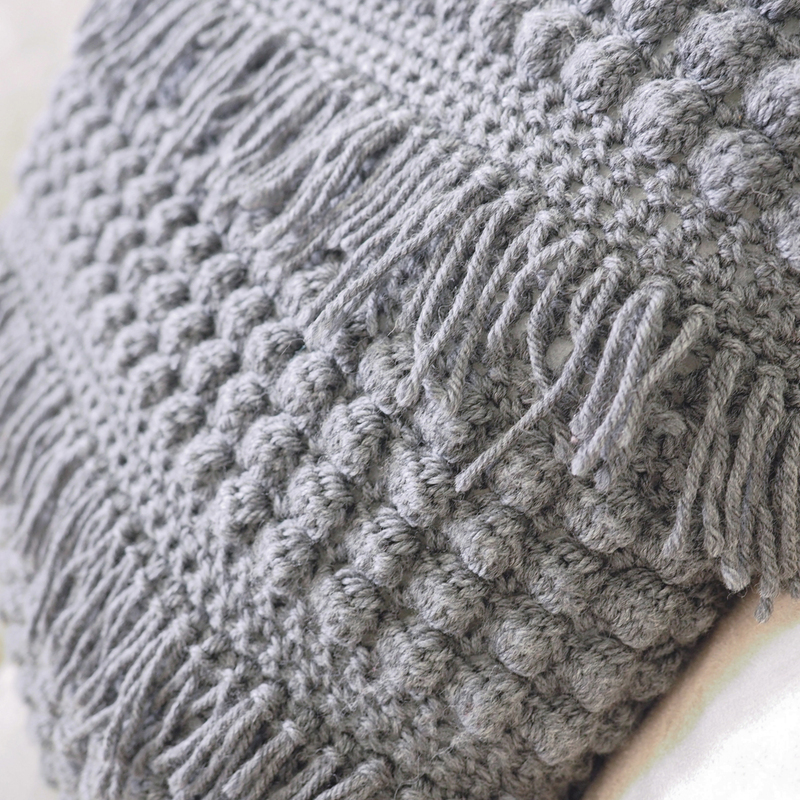 This cushion is made with Cascade 220 Superwash and it was a perfect choice for this pattern. Cascade 220 is 100% wool, so you know you’re working with an all-natural, top quality yarn. Its wool fibers lend this yarn plenty squish and softness, which is exactly what you want for this cushion. Plus, it’s super affordable and comes in a wide range of colors so you can make the perfect cushion for any room. 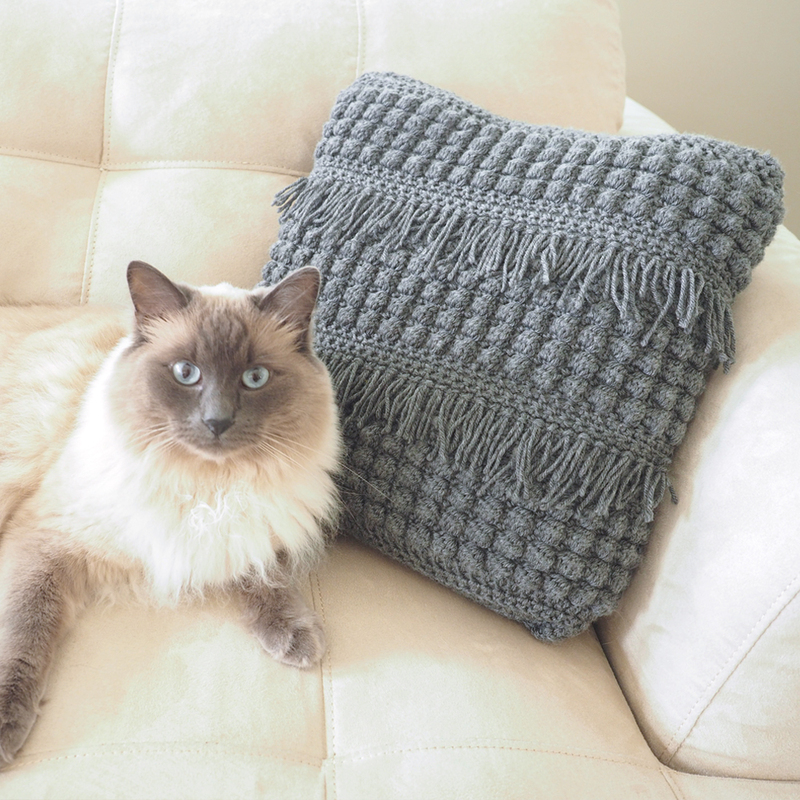 Get The Crochet Textured Cushion Kit Here while it’s still available. Suggested yarn: Cascade 220 Superwash Merino in Charcoal Heather (27). 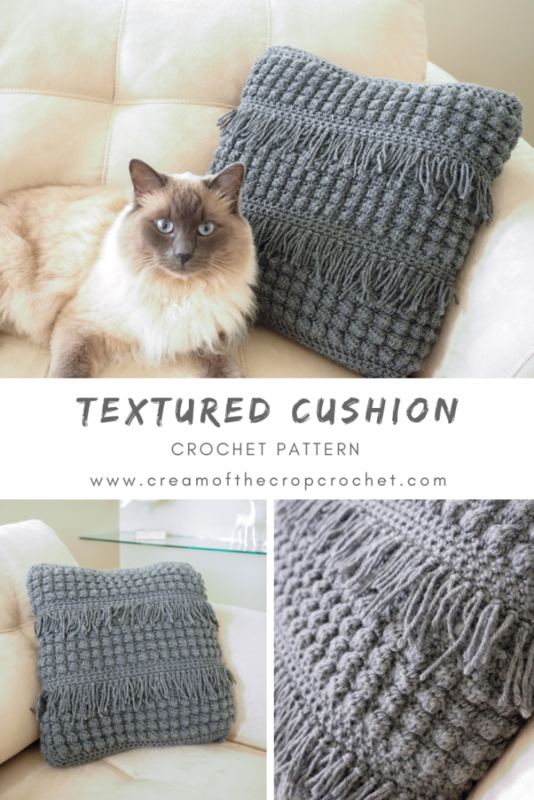 Get this yarn and the digital pattern in the Crochet Textured Cushion Kit we put together here. Bobble: (yoh, insert hook into st, pull up a loop, yoh, pull through 2 loops) 5 times in indicated st, yoh, pull through all 6 loops on hook. Beginning Bobble: Ch 3, (yoh, insert hook into st, pull up a loop, yoh, pull through 2 loops) 4 times in indicated st, yoh, pull through all 5 loops on hook. Rows 2-4: Ch 3 (counts as first dc here and throughout), turn. Dc into each st across . Rows 13-16: Ch 1, turn. Sc into each st across. Rows 17 and 18: Ch 3, turn. Dc into each st across. Rows 19 and 20: Ch 1, turn. Sc into each st across. Rows 45-48: Ch 3, turn. Dc into each st across. At end of last row, fasten off. Placement: Fringe will be placed over the top of the dc rows that are directly above the second and third set of bobble stitches. Cut 6” pieces of yarn, fold in half and pull around post of double crochet stitch, pull ends of yarn through the loop and tighten. I alternated between using 1 strand of yarn and 2 strands of yarn for fringe. Trim different lengths to your liking. Place pillow sides with right sides facing in and stitch around edges leaving an opening for pillow form or stuffing. Turn pillow right side out and stuff pillow; stitch together along remaining open side. Weave in all ends. 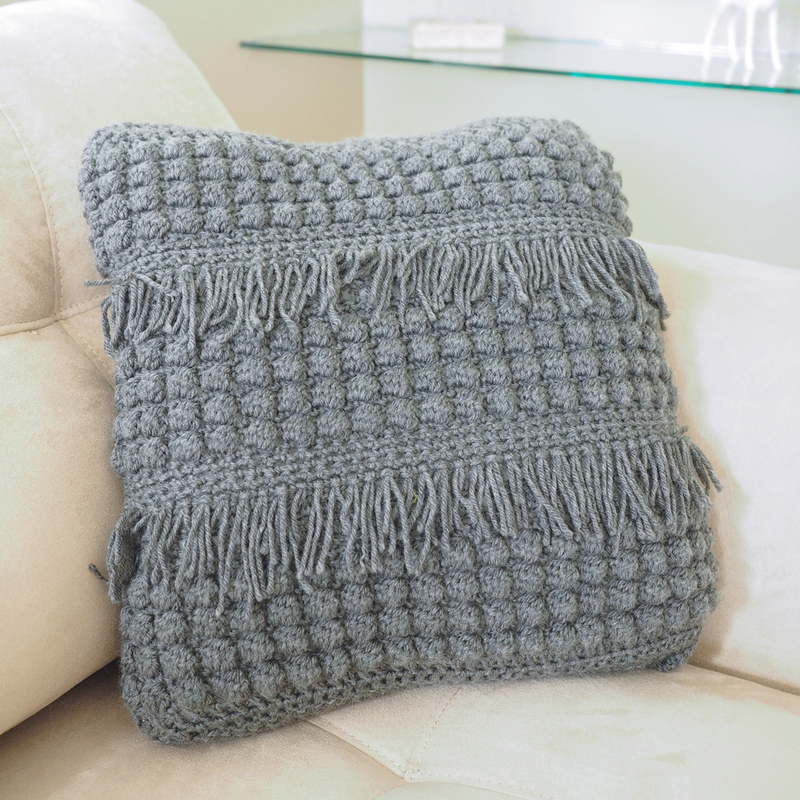 Whether you’re looking for an accent pillow for your living room or a great gift for a friend, this Crochet Textured Cushion is a crowd pleaser. It looks far more complicated than it is, and it such a fun pattern to work up. Whether you make it in the chic Charcoal Heather color like me or you choose a different color, this pillow is the perfect way to add an easy accent to your home.